Little treasures for each season were lovingly stitched, painted, or stamped by my mother. Each reminds me of how she embraced each season for its positive qualities, even though spring was obviously her favorite time of the year. This January quilt block features adventure and whimsy as she combined her own hand-applique, satin ribbon and French knots, and tiny buttons in shapes of bunnies and snowmen. Always frugal, fabric choices came from mom's fabric scrap bin, making this block homespun and all the more interesting to look at. I look at this and remember how much mom enjoyed designing and creating each scene. Winter. Your mom was very creative. 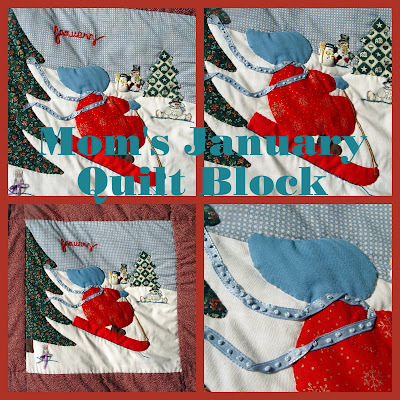 Love the January Quilt Block. Oh, that is a precious little scene! I love the "movement" of her flowing scarf! Your mom must have had quite a bit of whimsy and wit to created such a fun quilt. So creative! Such a nice piece of your mother's handiwork. I have treasures from my mother that are becoming more dear all the time.